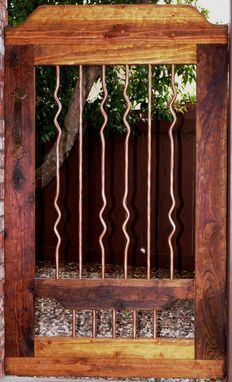 This rustic gate is made with solid wood and wrought iron. It features a distinctive hand-distressed, aged look with solid hammered iron bars. Hammered wrought iron gate pulls and hinges further complement the rustic feel of this unique courtyard or garden gate. This unique gate makes an ideal entry for courtyards or gardens with Southwest, Hacienda, Ranch, or other rustic style environments. It will be made to fit your specific entry/mounting requirements. I will advise you on all options/requirements for your specific application to ensure a trouble-free gate installation. Prices start at just $995. - Solid hammered steel bars (available in several colors/finishes). - Solid, distressed wood with your choice of premium quality exterior wood finishes. - Custom sizes made for your opening and mounting requirements. - Custom gate hinges, mounting bars/posts, pulls/handles, and locks/latches. - Patina and powder coat finish options for metal components.